Remember when gold was $1,200 and going up? The gold nuts said it was never ever gonna end? Of course neither was the real estate bubble, the internet bubble, RCA in the 1920s and 30s or tulip mania long before that. 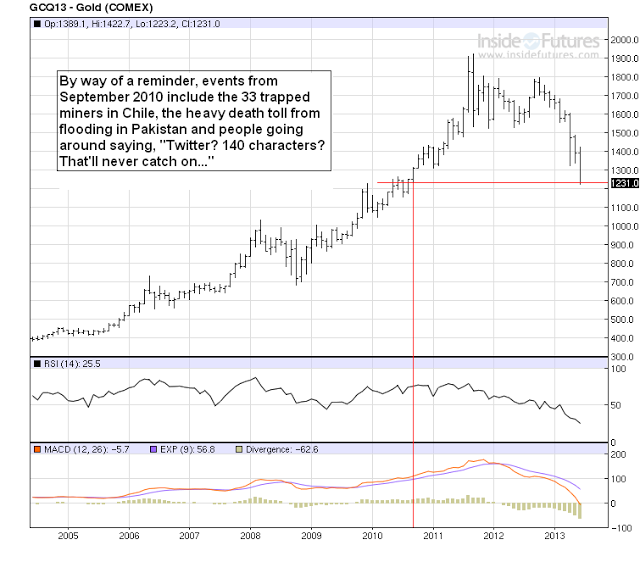 Gold is a fickle thingy and I have no earthly idea where it’s going next. Maybe all the retail investors are dumping gold to jump in the big DOW / S&P500 comeback? If that’s the case surely we should call a top in the DOW / S&P500 in the next 24 months or so? Hey Otto: special request, how about an S&P500 chart expressed in ounces of gold? See if that tells us anything. PS: On a serious note, I haven’t seen main street Peru react to the lower gold prices, there is still this “party will never end” attitude and that could be trouble: with the good macro numbers that Peru had been posting on the back of rising mining revenue also came an increase in consumer credit, imported consumer goods, declining trade balance, etc. Not saying end of the world is coming but I doubt Peru’s internal economy is as strong as many have come to believe. PPS: Even I had something to say about gold going up at $12 something. This entry was tagged chart of the day, gold, IKN. Bookmark the permalink.